After a slightly dull start it was mostly sunny during the early part of the walk but it became a little cloudy and overcast as the day wore on. There was virtually no wind at all on the tops. I took the path that more or less follows Trout Beck towards The Tongue and then climbs across Park Fell. On reaching the ridge I followed the course of the Roman road for a short while before heading along the path the runs eastward towards the summit of Mardale Ill Bell. In my view this summit is far more interesting than some writers suggest. There are excellent views in the direction of Haweswater and also in the opposite direction towards Froswick, Ill Bell and Yoke. 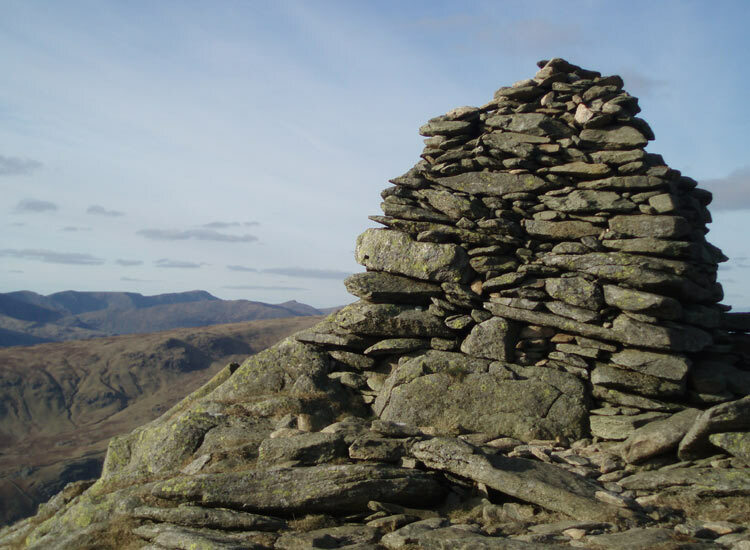 From Mardale Ill Bell I headed back west towards Thornthwaite Crag and then onto Froswick, Ill Bell with its three massive cairns, and Yoke before dropping down and re-joining Trout Beck at Ing Bridge. This was a tremendous walk on a day that was almost perfect for wandering on the fells.